Having grown up in a small town in the very North Eastern corner of California, i never really got the seafood experience until moving up north. I had only ever really had clams in chowder, and yes, the canned kind. Little did i know just how much fun they could be! Just an hour and 15 minutes outside of Seattle are a pair of cabins located on the water of the Case Inlet. The inlet is an arm of water in the southern Puget Sound region between the Key Peninsula and Harstine Island... aka clam paradise. My first trip here unloaded all kinds of information on the "clam culture" that really exists in the PNW. 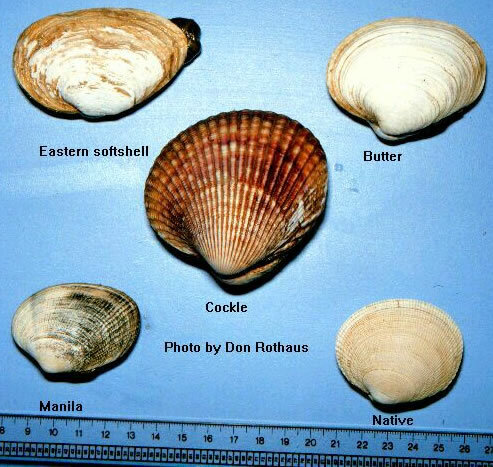 From the Washington State Department of Fish & Wildlife, "The legal minimum size for Manila clams, native littleneck clams, butter clams and cockles on public beaches is 1.5 inches. There is no minimum size for any other species of clam (this includes geoducks, horse clams, varnish clams, and softshell clams) nor is there any minimum size for mussels. At Quilcene Bay WDFW Tidelands, the legal minimum size for clams is 1.25 inches. To prevent waste of the resource. Clams grow fastest when they are small, so taking them before they reach 1.5 inches wastes all that potential for growth. Undersized clams and any clams not taken can be easily replaced in the harvest hole and covered shallowly; they'll survive just fine, grow bigger and have a chance to spawn. Click here for more information on the requirement to fill clam holes." For more information on sustainable clamming, crabbing, and fishing visit the WDFW website. Make sure to check with the Washington State Department of Fish & Wildlife about Red Tide and Domoic Acid Levels Before Clamming! Before you cook the clams, you have to clean them! Soak your clams for 20 minutes in fresh water just before cooking. As the clams breathe they filter through water. When the fresh water is filtered, the clam pushes salt water and sand out of their shells. After 20 minutes, the clams will have cleaned themselves of most of the salt and sand they have collected. If clams are your main dish, it's about one pound per person. Prepare grill for medium-high heat. Place clams directly on grate and grill (no need to turn or rotate) until they pop open, about 3–5 minutes. Transfer clams to a large bowl, discarding any that are not open. Serve with a salad, pickled veggies, toasty bread, and wine for a super easy fix. Yes, there are a few mussels in there too. I got lucky scoping out the rocks!